Review by AllTheBestFights.com: 2016-08-13, boring fight between Roy Jones Jr and Rodney Moore: it gets one star! The 47-year-old former world champion in four different weight classes Roy Jones Jr entered this fight with a pro boxing record of 63-9-0 (46 knockouts) and he is ranked as the No.83 cruiserweight in the world while his opponent, Rodney Moore, has a record of 17-11-2 (7 knockouts). Jones ‘Junior’ lost to Enzo Maccarinelli in 2015 (=Jones Jr vs Maccarinelli) but he came back to win in 2016 beating Vyron Phillips while Moore comes off nine consecutive defeats! 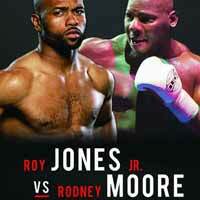 Jones Jr vs Moore is the main event of the evening. Watch the video and rate this fight!